Live streaming of large OTT events is a huge challenge. Whether it’s the Superbowl, the World Cup, the Olympics or ‘Sweden’s Got Talent’, it will come with a lot of publicity and social media coverage amongst your target audience – so it better not go wrong! High quality OTT delivery of your big events requires specific solutions to address these challenges. Edgeware allows you to manage the critical onboarding phase, ensuring a high quality, low latency viewer experience. 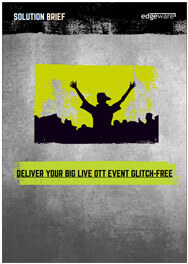 In short, this solution brief explains how Edgeware can help you deliver your big event glitch-free.